Andi DuPre, the winner of Live Action’s March for Life contest, has always been strong in her pro-life convictions. It’s what led her to join FOCUS (Fellowship of Catholic University Students) as a missionary volunteering weekly at a pregnancy care center, and it’s also what led her to the March for Life not once, but several times. 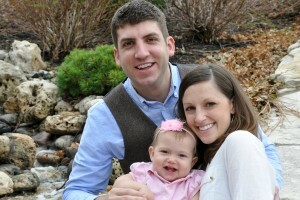 The March for Life holds a special place in her heart, not just because of how inspiring and spirit-lifting it is to walk with 500,000 other pro-lifers, but because the March is where Andi met her husband Sean as a FOCUS missionary in 2010. 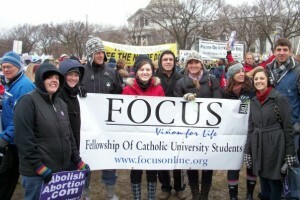 Andi and Sean (far right) at the 2010 March for Life. ”One of the missionaries, Danielle, had talked her younger brother Sean and his friend into coming to the March and tagging along with our group for the weekend. Sean was currently living in Naperville, IL and I was serving at Missouri State University in Springfield, MO. Over the weekend Sean was quite flirty with me,” remembers Andi, “I thought he was funny and enjoyed his company but can honestly say that I didn’t take him too seriously or give it much of a second thought. Not only did Sean call her, but the two spent the next few months writing letters in order to get to know each other long-distance. By the time the next March for Life came around, Sean was moving to Missouri to be closer to Andi. One year later, they were engaged. Andi and Sean that their wedding. These days, life is joyfully hectic for Andi and Sean. They are in the midst of a move to Chicago, where Sean has been hired by the Archdiocese to assist with their Capital Campaign. Meanwhile, Andi is busy as the assistant director of annual giving at Benedictine College. The couple has an 18-month-old daughter, Gianna, named after Saint Gianna Beretta Molla, an Italian pediatrician, wife, and mother who refused an abortion and a hysterectomy while pregnant with her fourth child, despite the risk to her own life. In May, Gianna will be receiving the gift of a new baby brother or sister. Unfortunately, moving during the same week as the March meant Andi couldn’t make the trip. So she did the next best thing. Andi has a strong desire to be a part of the pro-life movement, and while she may not have been able to attend the March this year, she’s glad she was able to gift the trip to her brother. And soon enough, they’ll be a younger generation of DuPres marching along for the right to life.